The Picklock Card in Fallout 76 is a Lockpicking Perk which the player can unlock to pick locks more easily. Fallout 76 features many perks to unlock in the game, but Picklock is one of the most main perks you must get early in the game. We at Gamer Tweak will help you to unlock perk card as soon as possible. Before you start unlocking the lockpicking perk in Fallout 76, you must reach level 5 to make the perk card available. It might take you a couple of hours to reach there(depends on your gameplay), but if you are still struggling with the level then check our Tips and Tricks guides for Fallout 76. Once you reach Level 5, you will also unlock the PvP combat. Now you have reached Level 5 and the game will prompt you will option to select a perk. Go into the Perception group, swipe through the available perk cards until you reach the one called Picklock. 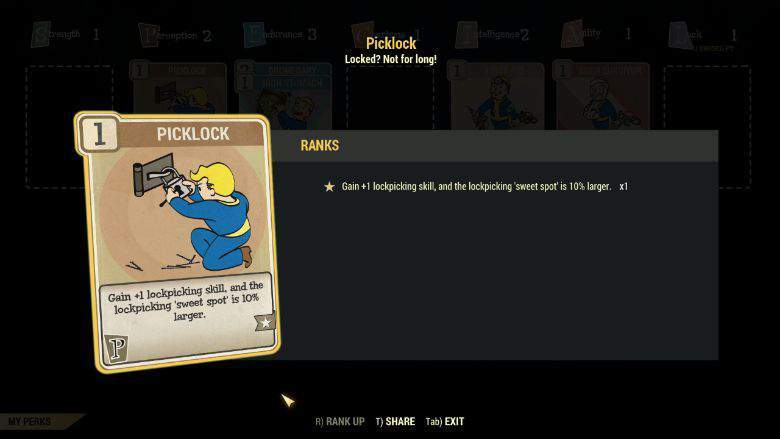 If you select this card then you “Gain +1 lockpicking skill, and the lockpicking ‘sweet spot’ is 10% larger.” Although this is just the base level of the perk; and you must upgrade two more to Master and Expert the Lockpicking skill in Fallout 76. Note: Unlocking the Lockpicking perk cards is not the end You will still need bobby pins to pick a lock. Check our other guides on Fallout 76 Cheats, Tricks and Unlock locations for Power Armor.